Choose from our wide range of Monitor Arms. When your solo monitor could use a bit of elevation, enjoy the Humanscale M/Flex Monitor Arm - One Monitor Solution to bring your desk into a new chapter of ergonomics. Its simple yet ingenious modular design allows users to add arms to their setup easily, without having to start from scratch. Enjoy the versatility and freedom to mount your screens where it's ergonomically comfortable for you. The arm is capable of supporting screens up to 20 pounds, freeing up much-needed desk space at the same time. The M2.1 Monitor Arm has a simple design with fewer moving parts than the average monitor arm. Fewer parts mean there is less likelihood of wear and tear or breakdown. Additionally, the dynamic M2 M/Flex utilizes a mechanical spring rather than a gas or hydraulic mechanism, reducing chance of failure. The M8.1 Monitor Arm should be the choice for users who need a heavier-duty solution. No monitor arm on the market can match the high weight capacity of the M8.1 M/Flex. Its dynamic arms support monitors up to 40 lb; its straight arms support monitors up to 60 lb. The Humanscale M/Flex Monitor Arm is available in your choice of three finishes: polished aluminum with white trim, silver with gray trim, or black with black trim. The Humanscale M/Flex Monitor Arm is easy to mount to your desktop with a clamp or desktop mount. We also offer mounts for slatwall, drywall, as well as a c:scape mount. The Humanscale M/Flex Monitor Arm is available with a 12'' or 18'' high post. 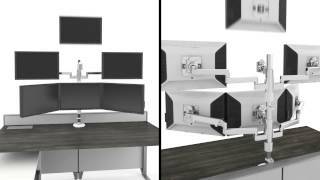 Your monitor will attach to your Humanscale M/Flex Monitor Arm with a VESA plate adapter. Most monitors come with a standard 100 mm x 100 mm VESA adapter, but for larger monitors and older monitors, yours may be different. mounted this on a book shelf next to a portable desk. WIth the adjustable swing arm and adjustable heights I have always found a comfortable view. This is a solid product and holds a 22 inch monitor with ease.